Being a customer oriented organization, we are deeply engaged in offering a wide array of Lion Wall Touch. 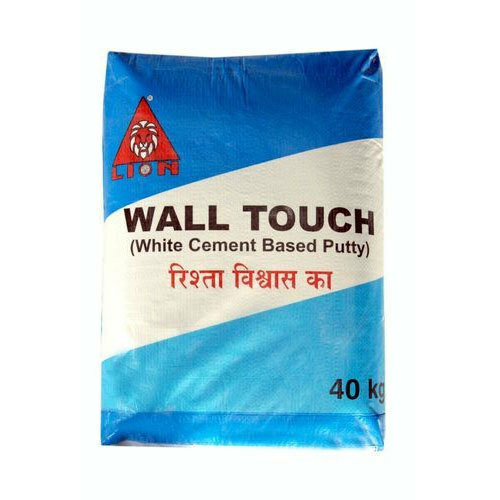 Lion Wall Touch (Wall Putty) is a White cement based polymer modified wall putty specially developed as a finish coat to cover unevenness and pinholes in plastered surfaces and to make the walls/ceilings ready for painting. As it is white, it can be treated as a base coat for painting. Lion wall Touch specially developed as a finish coat to cover unevenness and pinholes in plastered surfaces and to make the walls/ceilings ready for painting. Using a steel trowel/blade, apply the above mix to a thickness of about 0.5-1mm level and smoothen the surface. Apply the second coat 0.5-1mm after the first coat has fully dried and set. In areas of high temperature & low humidity for two days is recommended. The thickness of each coat should not exceed 1mm and total plaster thickness should not exceed 2mm. Take 300-400 ml of clean water for 1kg of LION WALL TOUCH (wall putty) in a clean bucket. It is very important that Lion Wall Touch to be Added in water and not vice versa. Stir continuously by using an electric mixer or by hand to obtain a homogeneous lump-frCoverageee paste. Allow the resultant paste to stand for about 10 minutes for the additives to dissolve. Re-mix again for about 2 minutes. The mixture is now ready. Maximum two coats (Layers) of Lion Wall Touch. Minimum thickness of 1st coat (Layer) 3 to 4 mm. Maximum thickness of 2nd coat (Layer) 3 to 4 mm. Total thickness can go up to 10 mm in 2 Layers. Approximate achievable coverage is 6-7 sqft./kg/3mm however, actual coverage achieved depends on surface condition. Although Lion Wall Touch do not contain any toxic material, use rubber gloves while mixing. Precaution should be taken to avoid dust inhalation while handling putty powder or during removal of application marks with fine emery paper-say wearing nose mask. Once putty paste has hardened, it shall not be used by adding water. Factory sealed bag of this product are guaranteed to be of first quality for Six month * if stored off the ground in a dry area. Founded in the year 2004, we “Lion Industries” are a dependable and famous manufacturer of a broad range of Tile Adhesive, Tile Grout, Tile Cleaner, etc. We provide these products in diverse specifications to attain the complete satisfaction of the clients. We are a Sole Proprietorship company which is located in Vijapur (Gujarat, India). Under the supervision of “Mr. Jigar Patel” (Export Manager), we have gained huge clientele in our country. These are manufactured using quality chemical compounds that are sourced from the finest vendors of the market. Before we procure the required compounds, we take samples and test them in our laboratory. Being a quality conscious company, we strive to ensure that our products are of supreme quality. This results in a precise mixture, allowing specialty concrete mixtures to be developed and implemented on construction sites. Rapid raise in business turnover has been achieved by delivering dependable, consistent quality which has become a benchmark of innovative research & product improvement. We are energy conscious & environment friendly organization striving to deliver best value to its customers with quality product and dedicated services. We have 15 branches and a mammoth network of over 700 dealers in Gujarat. We have a consistent performance & wide acceptance by customers. Lion is India's 1st Silica Base Mortar. Lion is known in the industry for its impeccable quality & Ernest business practices. It is changing the face of India. Lion Group has not only helped to build the landmark projects, it has also built everlasting trust in engineers, builders, contractors, retailers and individual house builders which we believe is our real asset.